If you love playing pool, or any billiards game, the day will come when you think about buying a billiards table of your own. 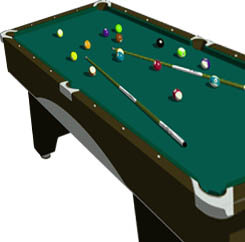 Here are some quick and awesome tips on how to choose a billiards table. Tip #1 – Go for Slate! There is nothing else better for a great pool table than real SLATE! What is slate? Slate is shale or rock made from volcanic ash or clay that is quarried, cut and leveled into smooth flat sheets – perfect for sports such as billiards or pool. There are substitutes like plywood, fiberboard, slatex, and do forth, but none of these alternatives give you the smoothness and accuracy of slate. The Billiard Congress of America (BCA) recognizes 1″ slate as the most accurate slate available and requires at least 1″ slate on tables used in tournaments and competitions. Some manufacturers will use thinner slate, but what you want is that the slate is truly 1″ thick. Confirm this before you buy, or you may be unhappily surprised later. Tip #2 – Frames and legs are important! Just like you want to keep your frame and your legs in good shape, so too your billiards table needs to have a strong frame and strong, straight legs. Lacking this, the slate surface can sag, crack and become uneven. In a high-quality pool table, the slate will be framed with wood, glued to the bottom and have cross beams. This all adds support to the slate, and will keep the table in great shape for years to come. There are two types of legs: post legs, and two-piece (“industry standard”) legs. You will want the POST LEGS. Strong, reliable and will hold up under normal stresses of game play. Of course, never sit around on the table edge drinking a beer – that’s what couches and cozy overstuffed armchairs are for. Tip #3 – Get Felt! That’s not a joke! Real billiard table-type felt is what you want! These days, pool table felt is typically made from a wool and nylon blend that’s been coated in Teflon. To determine the quality of cloth, take a look at the ounce weight per yard of the felt; 18 and 22 ounces per yard is best. If you want speed and traction more than simple durability, worsted cloth, usually made from wool, is the best bet. There are other things to consider, of course, but these tips are the basics. If you are going to choose a billiards table, there is much to consider (like size, depending on your home and/or your game room) and research online is highly recommended before any purchase is made. Also, look for reviews, referrals, and comments online that can help you choose well, and spend your money wisely. Try out really good tables at your local billiards place (like the Diamond tables at Jester’s Billiards) and you will get a sense of just how important quality really is when you are out to choose a billiards table for your home! Or office, maybe… that would be cool!